Sherise is a member you can’t ignore. She is loud, loving, happy, full of personality and life and LOVES making friends with everyone! She has been with us for almost five years and it has been an incredible journey watching her grow to be the amazing young woman and athlete she has become. She recently graduated with a degree in Nursing, started the competition program and is working harder than ever before to reach both her life and fitness goals. 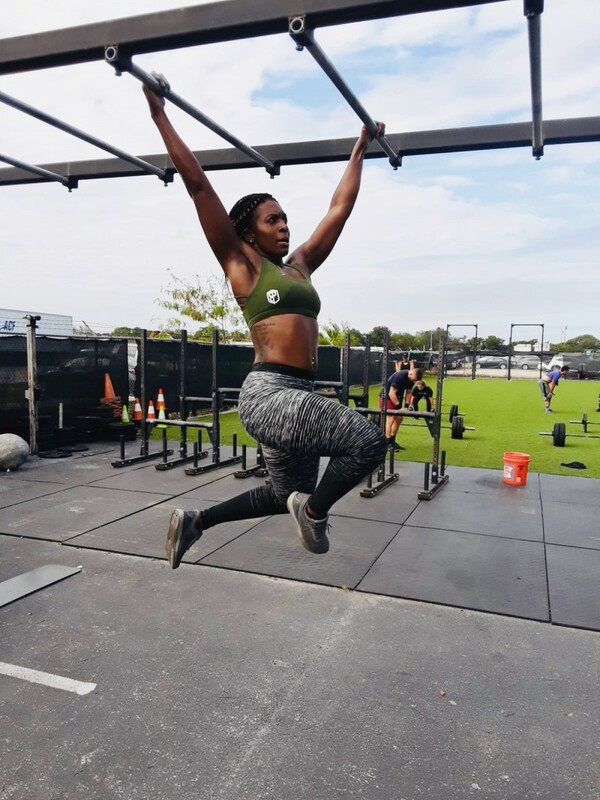 When Sherise is challenged by a fear of a particular movement or trying something new, she has proven she can work through difficult moments and overcome anything! We are excited to see what great things she will do in the future! I’m 23, I just finished nursing school, and I’ve been doing CrossFit at this box for about 3 or 4 years now, and I absolutely love it; the people, the atmosphere, the workouts, every scrape and rip I’ve ever received from this place. I used to go to the gym and do those classes like spinning and zumba and I would hate going because it was so boring and repetitive. Everyday the same thing and after I would not feel accomplished. I heard my friend talking a CrossFit and I did my research and I ended up at Freakin CrossFit and there was no turning back. I’ve learned how to push myself beyond limits that I didn’t even know I had. I’ve learned to not take no for an answer when it comes to fitness, I can do anything I put my mind to. I’ve learned how to eat better and that balance is key when it comes to nutrition. I’ve also learned how to adapt to different personalities and to be more social. When I finally strung along 10 toes to bar, got butterfly pull-ups and handstand push ups, even though I still use a mat (fears ill eventually overcome 😊). I don’t really have a favorite movement, I just love lifting, if its power cleans, hang cleans, snatching, I just love lifting! My goal is to finally do a muscle up. My nutrition has changed dramatically since I did Freakin Nutrition. I would either eat too much protein and not enough carbs, vice versa. I didn’t really know how to balance food groups. Now I count my macros and meal prep so I know exactly how much of each food group I’m consuming. What is one tip you would give someone who is thinking about starting CrossFit or just started? I always hear new members say I’ll never be ale to do a pull up like her or I’ll never be able to lift as much as him. Don’t ever watch the person beside you and compare yourself to them. They were also a beginner at some point, they just trained hard to get to where they are. In time you will get there. Every day that you train you’re getting stronger, mentally and physically. Focus on good form and listen to the coaches and your body. One day you will be just as good maybe even better, who knows. Have patience and never give up. Keep pushing, this initial fear will go away and you’ll fall in love with your progress, I promise. I too have been in your shoes. When I’m not at CrossFit I’m thinking about CrossFit, what is my next workout going to be. But I love shopping, hanging out with the great people I’ve met at CrossFit (we call it outside the box) and looking for new adventures to take. Anything else they would like to add: keep pushing, it will be worth every blood, sweat and tear and you will do it all here, I guarantee it.